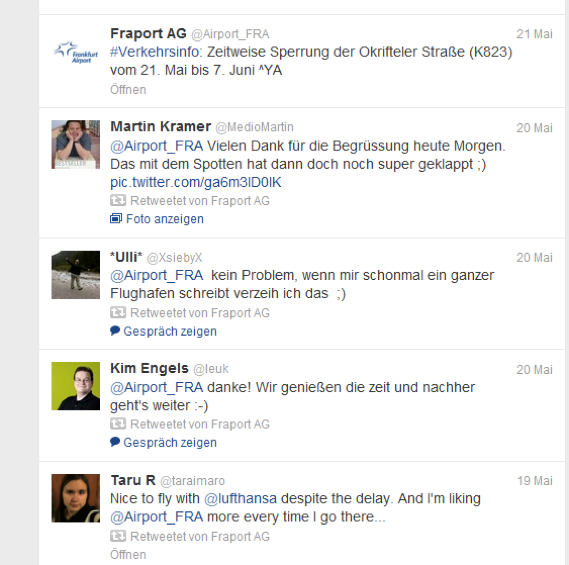 The fact that airlines are successful in using social media for marketing campaigns and customer service is well known. But how about airports? How are they engaging on social media? In this blog four airport examples that will show airports are increasingly becoming a social media communication hub for a variety of purposes. In a study by SymplyFlying.com amongst 55 airports worldwide it is found that 100% of the airports are investing more then 50 man hours per month on social media. Most of the airports’ social media budget is allocated to the marketing and corporate communications department. 100% Of the airports indicate actually to be using social media for brand engagement and 86.2% for customer service. While only 7.3% (!) of the budget is allocated for customer service. Where does this tension for budget allocation come from? Is it disbelief of the added value it brings? Is (old fashioned) marketing simply first choice? Is it because a marketing campaign is more easily measured compared to the fact that customer service or satisfaction has increased via social media? Or is it simply fear of the new and more dynamic or transparant way of communicating? Let’s take a closer look at four airport engagement examples. In May 2013, Eindhoven Airport was the worlds’ first airport to introduce Facebook VIP perks to its fans. By liking the Eindhoven Airport Facebook page you would have the chance of getting your own free VIP parking and several other perks such as free breakfast and fast check in. A nice and creative way to grow the number of fans in a community and of being in touch with “guests” starting their journey. On April 18th 2014, Eindhoven airport was declared most popular airport in the Netherlands (according to a survey by Zoover). Their speed, friendly service and atmosphere in the airport are the main arguments why passengers are increasingly choosing to fly from Eindhoven. Check out the VIP program on Youtube. Schiphol Airport in the Netherlands introduced a new service for surprising your facebook friends. It allows you to select a present online (a farewell drink, gift or dinner), pick your travelling friend via facebook, who will get a personal message (in combination with a code) on his facebook timeline. Via this code your friend can collect his suprise in a shop or restaurant while waiting for departure. Want to know more about what they do and discover the newest information about Amsterdam Airport Schiphol? Check it out here! Frankfurt Airport is a good example of how the social media presence of an airport is spreading across multiple social networks and is actually moving towards real dialogue. They are clearly a front runner in embracing the travellers’ choice in communication channels. 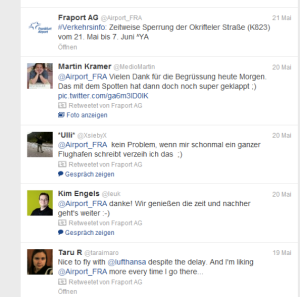 Here’s why: @Airport_FRA is not only active on Facebook and Twitter. They are also active on Pinterest, Youtube, Yelp and Foursquare. All travellers checking in on Foursquare or asking a question on Twitter/FB etc. are getting a warm welcome and Frankfurt Airport wishes them safe travels. The impressive part is that they do this 24 hours a day, 7 days a week with their editorial teams standing by. 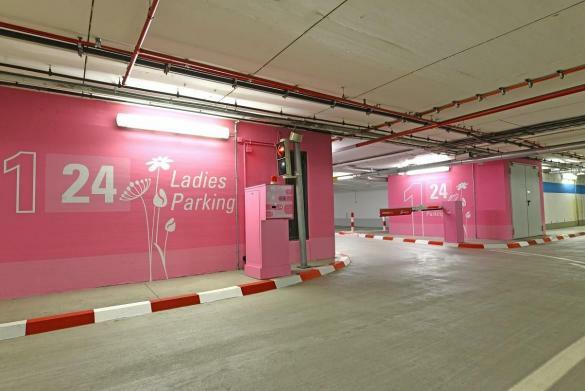 By the way, there was also some social discussion taking place on Frankfurt Airport’s special approach to women’s parking. Its coloured pink. Refreshing right? More serious it becomes when an airport is confronted with unique weather conditions or strikes. In that case many inbound and outbound travellers are desperate to be up to date about the consequences for their journey. Storm Xaver in the North of Europe in 2013 was a great example. @HamburgAirport provided continuous information and updates on the status of the approaching storm. They involved their fan base by sharing several video’s (timeframes) of how the airport was preparing for this approaching storm. They gave a nice look behind the scenes of all necessary precautions they had to take to allow “business as unusual”. How to improve passenger spending at airports? 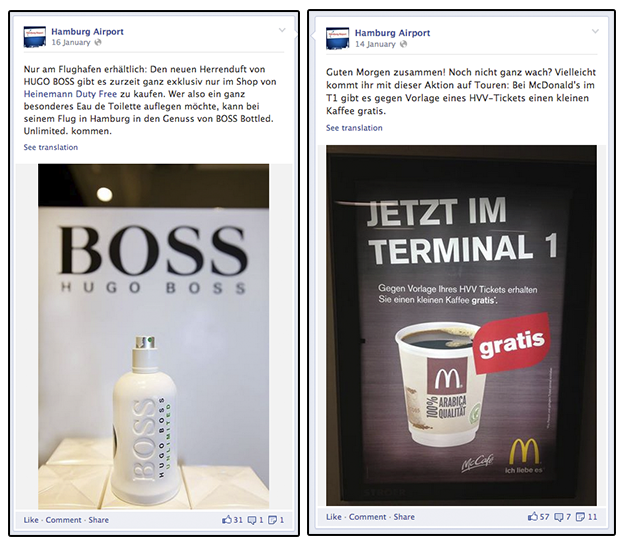 Hamburg airport is also communicating on behalf of its shops and restaurants and other stakeholders of the airport. It is an unselfish way of managing their social media and communicating partly on behalf of others. It shows they understand their role and try to provide added value. After all, airports do not only make money on airlines fees but also on passenger spending at an airport. Following the various initiatives of Airports, it would make sense that the available budget – at first – is allocated mostly for marketing and general corporate communication. Social Media is the new kid in town and is still fighting for its position within the various departments and “social marketing” brings quick wins with simple (yet measurable) results such as likes, reach, people talking about this etc. However, going beyond the positive vibe a marketing campaign brings, there is true added value in the communication or dialogue between airports and its travellers. Hence, airports will increasingly allocate a larger part of their social media budget to customer service (engagement) purposes. Simply because the digital traveller will demand from airports to communicate in their channel of choice. Making the digital “airport experience” more important for airports in adding value to its travellers. Next to this increased focus on customer service or engagement, airports become the “social media hub” in order to provide added value not only to its travellers but also to its other stakeholders. 3- Social Media Hub – Social Communication between airports, travelers and various other stakeholders (restaurants, shops, security, general other info) ultimately optimizing ROI for all. In the next blog I will focus on the measurability of social media customer service and the added value this brings to an airport. Amongst others, I will elaborate on the importance of adjusting traditional Performance Indicators to the dynamics of the social landscape. What performance indicators are key? How can conversation history (social CRM) on an individual level help deliver a unique digital airport experience?